Every month this year we have said it couldn't possibly get any worse for David Einhorn's Greenlight, and the very next month we are proven wrong. 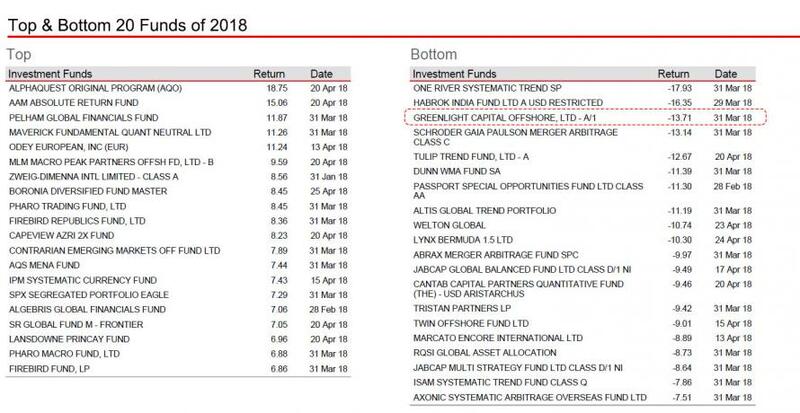 Recall, last month we reported that Einhorn’s main hedge fund fell another 1.9% in March, extending its loss this year to 14%, which we said that while superficially was not that bad (as it outperformed the S&P's 2.5% March drop), that would hardly enthuse Greenlight's long-suffering LPs who have been patiently waiting for Einhorn to have another home run, and which failed to happen despite the March tech bust, which Einhorn was expecting with his "short basket". "In other words", we said "David will be sending another letter to his clients explaining why this all "must be frustrating to you." One month later there is no letter yet, but the deterioration continues, and according to Bloomberg, Greenlight Capital fell another 1.1% in April, extending the total loss this year to a stunning 14.9% just four months into the year. In a letter to investors sent out in early April, Einhorn said that he had encountered the perfect storm in the market, where he lost money on both his longs, which slumped, and his shorts, which spiked, resulting in a roughly 14% loss in the first quarter. As we reported a month ago, Einhorn's, 20 biggest long positions fell 5.6%, and his 20 largest shorts fell 5.5%. Fast forward to today, when Einhorn reiterated his disappointment this morning on a conference call for Greenlight Capital Re, the Cayman Islands-based reinsurer where he is chairman. He repeated that Greenlight’s gains from his Micron long Tesla short did little to offset broader losses, led by an investment in General Motors and a short against Netflix. GM dropped 11.3% in the first quarter, while Netflix surged 54%. As Bloomberg adds, on Monday Greenlight Re reported a loss per share for the first quarter of $3.85, and a net investment loss of $145.2 million in the first three months of the year on the back of the portfolio’s poor performance. Einhorn reiterated the bear thesis against Netflix, saying that while the company managed to pull in more subscribers than expected after spending on marketing, technology and development, free cash flow is deteriorating. "In our view, Netflix has shown an ability to turn cash into subscribers, but not the ability to turn subscribers into cash," he said.